Why we are opposed to people forwarding Christian the Lion Reunion: No matter how many times you say that big cats should not be bred and traded as pets, if people see images of big cats acting like pets, they will continue to buy and dump them. More HERE about the kind of people who own exotic animals. If you have had Internet access for more than a week, someone has probably sent you the 1971 video clip of two guys hugging a lion. The story as presented almost cannot help but moisten your eyes. But it creates a misimpression that leads to abuse and abandonment. Look closely at the lion’s mane in the video. The small mane means this lion was approximately three years old, i.e. a cub, despite its size. Lion cubs grow quickly, typically reaching 100 pounds in just a year, and 200 by two years. It is mentally still a kitten until about five years of age and mentally still dependent on the object of its maternal bonding. Passing this video around is a bad idea. It creates the totally false impression that the bond created when a human raises a lion or other big cat cub will create an affection on the part of the cat that will last and make it safe to be with the cat when it becomes an adult. It more broadly creates the impression that it is safe to handle an adult big cat. This is simply not the case. There is no way to predict when a big cat, no matter how “tame” it may appear or how often it may have been used for physical contact without incident, will act on instinct. Roy Horn is one of the best known trainers in history, Montecore had performed many times, but all it took was one time when the cat acted on instinct to end his career. More tragically, a tiger at the Lost Creek facility had been used for “photo ops” many times before he acted on instinct and killed 17 year old Haley Hilderbrand who was having a photo taken with the cat to celebrate her high school graduation. Most of the cats you see in performing acts and petting booths or photo opportunities are under the age of five because they have not fully developed mentally. By fostering the notion that these cats will be safe to touch as adults, the video encourages foolish people to buy them as pets, which is legal in many states. As the cats become adults they become unmanageable, unsafe, and typically are either kept in squalid small cages, abandoned, sold or given to people who use them to make money, or destroyed. It also encourages people to want to touch them or have their photos taken with them. As long as that demand and opportunity to make money is there, people who typically keep the cats in horrible conditions will continue to breed these animals into a life of abuse. Please don’t pass this video around and if someone send it to you, please send them to this page. You can help end the vicious cycle of abuse. The following is what is known of the story behind the clip. 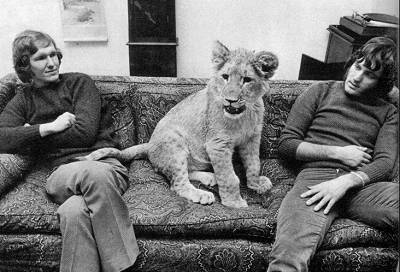 “Christian the Lion” found Travers and McKenna in an advanced case of déjà vu. In 1970, they were shopping for a desk and ventured into the World’s End furniture store on the King’s Road in London. The store managers, the Australian duo John Rendall and Ace Berg, recognized Travers and decided to show him the store’s mascot: a young lion. Rendall and Berg had purchased the lion from the Harrod’s department store a year earlier and were raising him on their own. But, of course, a furniture store is no place to keep a lion – and the combined salaries of two furniture store managers were barely keeping the animal fed. Travers and McKenna also decided to record this story as a documentary. The resulting “Christian the Lion” actually gets off on a bit of a strange opening, with a clumsy recreation of the actors’ initial discovery of Christian. For starters, the sound is badly out-of-sync – watching the opening sequence is disconcerting, as it is easy to assume the production is an amateur outing. Even worse, the facts have been trimmed to the bone. Contrary to the film’s assertion, Christian’s presence was not a surprise to everyone – the lion was actually something of a minor celebrity in London before Travers and McKenna showed up, and it was even featured in a fashion advertising campaign. Furthermore, the film ignores Rendall and Berg’s respective girlfriends, who helped in the care and maintenance of Christian. Rendall also wrote a book called “A Lion Called Christian,” but that’s not cited here. After that initial clumsy segment is over, “Christian the Lion” finds its traction and is presented as a real-time, real-life adventure. Travers and McKenna invited Christian and his owners to live with them while arrangements are made to transport him to Africa. They took the lion on outings for a spot of exercise – a romp in a closed-off church courtyard (with the vicar watching nervously from behind a curtained window) and a visit to the beach. The latter trip might have prompted the inclusion of the old British music hall ditty “Oh, We Do Like to be Beside the Seaside,” but instead the film’s score is provided in hippy-dippy melodies by the English folk-rockers Pentangle. Getting Christian to Kenya required a great deal of negotiations with the Kenyan government (obviously they had enough lions and weren’t eager to import one from England). Travers and McKenna, who alternate as narrators of the film, mention in passing that dealing with the Kenyan authorities took more time and energy than they expected. Nonetheless, they are able to get Christian transported to Kenya and into the care of George Adamson’s game reserve. The remainder of the film follows Adamson’s efforts to integrate Christian into his new surroundings. That first involved introducing him to other lions – up until this point, Christian lived exclusively with human company. Adamson tried to create a new pride of lions consisting of Christian and three other orphaned animals: the female Katania, the frisky tyke Super Cub, and a male lion named Boy who took an immediate dislike to Christian. However, once Boy and Christian determined the pecking order among them (Boy won the Alpha Male spot), the two became happy blokes. Adamson’s next challenge was getting this new pride to take care of itself in the wild. The lions had to learn to hunt and to defend themselves from other lions that roamed Adamson’s preserve. Did Christian and his new family make it in the wild (if you can call the preserve, the wild)? If so, how long? Does anyone know? There is a sequence late in the film that will soften even the most cynical of hard-hearts. The finds McKenna at a zoo in Amsterdam, where she has located Christian’s parents. The two lions are locked in a small, bare cage with a concrete floor. They pace endlessly and monotonously back and forth. It is tragic to behold these beautiful animals in such cruel captivity, and the viewer knows the beasts will never experience the chance for freedom that their offspring experienced. Details on the production history for “Christian the Lion” are somewhat difficult to track down. Some sources list the film as a 1971 production, others claim it was from 1976. One online source states the film was produced in conjunction with Rendall’s book, which came out in 1972, so that would probably put the film’s production closer to the earlier date. Also, a recent article in the Daily Mail outlines a 1974 reunion between Christian and his London buddies, but that meeting also included Christian’s lioness and cubs. There is no mention of this in the film, so I would assume the production wrapped in 1971 (it would seem peculiar to leave this post-script from the film). 1976 most likely reflects the year the film played in the U.S. There are also a few sources that insist “The Lion at World’s End” and “Christian the Lion” are two different movies. That is not the case. Scotia American went out of business in the mid-1970s and nobody seems to be claiming the film’s U.S. rights. Several distributors who specialize in public domain titles have been offering faded, muddy prints of “Christian the Lion” on home video and DVD.